All life on Earth — or that we know of in the whole Universe — is made up of six crucial ingredients: carbon, hydrogen, nitrogen, oxygen, phosphorus, and sulfur (often abbreviated CHNOPS). How and when life first emerged from a tangled chemical soup is still a mystery but researchers now say that all of these elementary chemical building blocks may have a thrilling origin. Billions of years ago, proto-Earth collided with another Mars-sized planet, which delivered the bulk of carbon and nitrogen required to seed life. The hypothetical planetary body, which some call Theia, is also believed to be responsible for the moon’s formation. Studies on primitive meteorites, known as carbonaceous chondrites, suggest that Earth and the rest of the solar system’s rocky planets are volatile-depleted. The conventional explanation is that Earth grew without these volatile elements — such as carbon and nitrogen but also lead, zinc, copper, silver, bismuth, and tin — and they only got added at a later time by asteroidal-type bodies. Researchers at Rice University, however, argue that this explanation fails to capture the full picture since silicate Earth (non-core material) has 40 parts carbon to each part nitrogen — that’s twice the 20-1 ratio seen in primordial meteorites. The team at Rice, coordinated by graduate student Damanveer Grewal, performed experiments in a test chamber that is specially equipped to simulate the high-pressure, high-temperature geochemical reactions that take place deep within the planet. These experiments tested the idea that a sulfur-rich planetary core might exclude carbon and nitrogen, leaving a much larger fraction of these elements in the bulk silicate. Three scenarios were tested: no sulfur, 10% sulfur, and 25% sulfur. Nitrogen was largely unaffected in these scenarios, remaining soluble in the resulting alloys relative to silicates. Only under very high sulfur concentrations did nitrogen start to exclude from the core. Carbon, in contrast, was less soluble in alloys. At the highest sulfur concentration in the core, there was up to 10 times less carbon in the sulfur-rich alloys than sulfur-free alloys. The researchers then designed a computer simulation that ran approximately one billion scenarios and compared them against the known primordial solar system conditions. The computer model suggested that Earth’s volatiles must have come from elsewhere. “What we found is that all the evidence—isotopic signatures, the carbon-nitrogen ratio and the overall amounts of carbon, nitrogen and sulfur in the bulk silicate Earth—are consistent with a moon-forming impact involving a volatile-bearing, Mars-sized planet with a sulfur-rich core,” Grewal said in a statement. All of this does not mean that meteorites haven’t made their fair contribution to life’s essential ingredients. 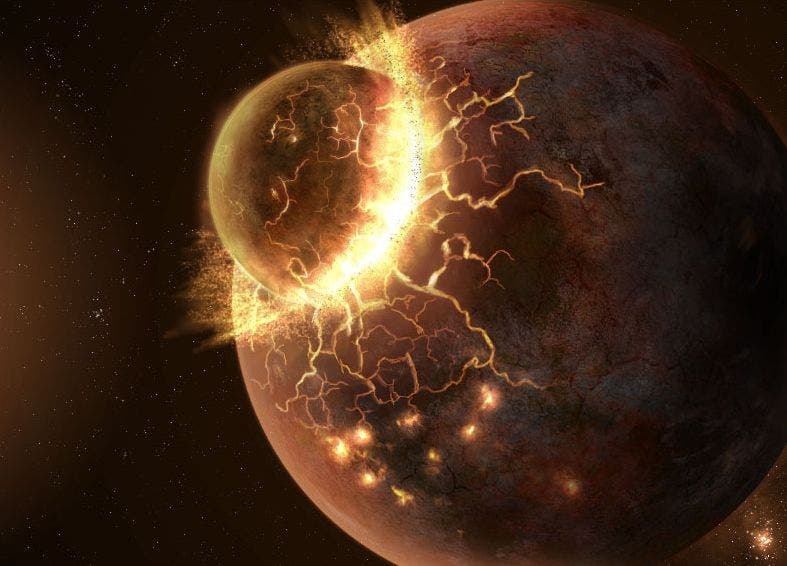 Even in a scenario where early Earth was supposedly impacted by Theia, many meteorites would have continued to crash into the new Earth for millions of years. What’s more, the new findings have implications not only for understanding how life began on Earth but also beyond the solar system. study co-author Rajdeep Dasgupta said.